This set of Tricky Surveying Questions and Answers focuses on “Conventional Symbols”. 1. Identity the below symbol. Explanation: Generally, wells are circular in shape. Hence, ISO standard symbol for well in Topographic surveying is solid circle. 2. Identity the following symbol. Explanation: Generally, boundary pillars are square in shape. Hence, ISO standard symbol for boundary pillars in Topographic surveying is solid square. 3. Identity the following symbol. Explanation: The above symbol is standard conventional sign for earthwork dam. This symbol is used to represent the earthwork dam in topographic map. 4. Identity the following symbol. Explanation: The above symbol is standard conventional sign for statue. This symbol is used to represent the statue in topographic map. 5. Identity the following symbol. Explanation: The above symbol is standard conventional sign for temple. This symbol is used to represent the temple in topographic map. 6. Identity the following symbol. Explanation: The above symbol is standard conventional sign for police station. This symbol is used to represent the police station in topographic map. 7. Identity the following symbol. Explanation: The above symbol is standard conventional sign for church. This symbol is used to represent the church in topographic map. 8. Identity the following symbol. Explanation: The above symbol is standard conventional sign for stone steps. This symbol is used to represent the stone steps in topographic map. 9. Identity the below symbol. Explanation: The above symbol is standard conventional sign for grave. This symbol is used to represent the grave in topographic map. 10. Identity the below symbol. Explanation: The above symbol is standard conventional sign for boundary marker. This symbol is used to represent the boundary marker in topographic map. 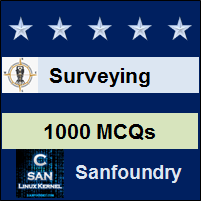 To practice all areas of Surveying, here is complete set of 1000+ Multiple Choice Questions and Answers.